As we saw in the roll-out of Chip & PIN over 10 years ago, the voice of the users of payment systems, particularly merchants and consumers, is vital to the development and rapid adoption of new payments initiatives. Having established Vendorcom initially as a forum for solutions providers, in the past eight years we have benefited from the involvement and influence of merchants, from all market sectors, who have shaped the discussions and decisions made on a wide range of topics at both our Thought Leadership Conference and Special Interest Groups. We are now introducing a formal membership for merchants from all market sectors who have a specific interest in payments and payments related topics. This is aimed at not only providing the opportunity for merchants to have direct access to the latest information on current topics covered in Vendorcom forums but to actively bring the widest merchant perspective into all of Vendorcom's activities. For many merchants, navigating the increasingly confusing range of 'innovations' that the payments industry promotes as self-evident 'must-haves' present a huge challenge. Having access to a source of independent, authoritative, coherent information on the options you face and the opportunity to compare experiences with your peers will be invaluable as you seek to determine how payment systems can align with your business requirements. Education, Fuel & Forecourt, Hospitality & Leisure - including Airlines and Travel, Public Sector, Retail - including Grocery, High Street, Department Stores, and DIY, Small & Independent Merchants, Transport & Ticketing. Contactless, NFC & Mobile Payments, Corporate Payments, Digital & Cryptocurrencies, Ecommerce Payments, Faster & Direct Account Payments, Identity & Authentication in Payments, Payments Legislation & Regulation, Payment Innovation, Payment Security & Risk Management, Traditional Payments - including cash and cheques. We welcome suggestions from Merchant Members on ideas for future market-centric SIGs as well as suggestions of the key payments related topics that may be of interest or are presenting significant challenges to include in our Industry Issues SIGs. Vendorcom Merchant Membership is free of charge, highlighting how vital we believe merchant involvement is in shaping the future of payments. 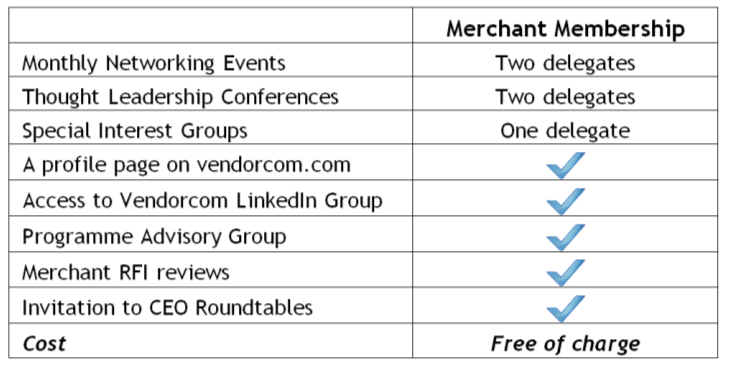 Merchant Membership offers free access to all of Vendorcom's core activities: Networking Events, Thought Leadership Conferences, and Special Interest Groups - both Merchant Market SIGs and Industry Issues SIGs. Membership is renewable annually based on membership application received date. To download an application form to become a Merchant Member, please click here. Vendorcom Corporate Membership is available for non merchant businesses with more than five members of staff. Vendorcom Small/Medium Business Membership is available for non merchant businesses with less than five members of staff.